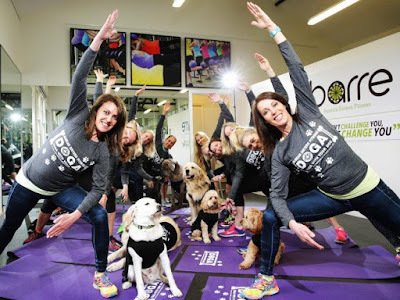 Doga: Keeping Fit with your Dog! We know that dogs are ideal training buddies! Canine owners are more likely to exercise regularly and tend to be fitter and healthier than their pooch-free peers. But sometimes walking around the neighbourhood or a trip to the local park becomes a bit tedious especially when the cold weather starts setting in, so what can you do to keep your motivation up this winter? We decided to take a closer look at the trend of "Doga" - a series of yoga moves you can practice with your dog. We spoke to fitness trainers, Adele and Lisa Rancan who have been running these classes for many years at the Rancan Sisters Fitness studio in the leafy suburb of Mosman, on Sydney's North Shore. Q: So when and where did this whole Doga craze start? Doga was developed in the USA by Suzi Teitelman, a Florida-based yoga instructor back in the year 2001. Since her dog Coali wanted to lie under her every time she was doing her practice on the mat, she decided to create a special yoga sequence for her and her dog! “Doga is about sharing your yoga practice with your pet." explains Suzi. "I have always called it a partner yoga class. There is not a pose that cannot be incorporated. Let me also say, that I know that everyone has a different size pet! Doga can be done with any size dog, it is about you and your dog. So modify Doga poses for you. This is a gentle practice with a lot of massaging, light stretches, relaxing and bonding. For me, Doga is very much an extension of traditional yoga: you flow from pose to pose, work on breathing and concentration, except that your dog is with you and you include him in the exercise. I never use treats to train dogs to do yoga poses: just a lot of love, praise and patience. " "We witnessed the benefits of Doga and the calming effects of the practice on dog and owner." says Adele Rancan. 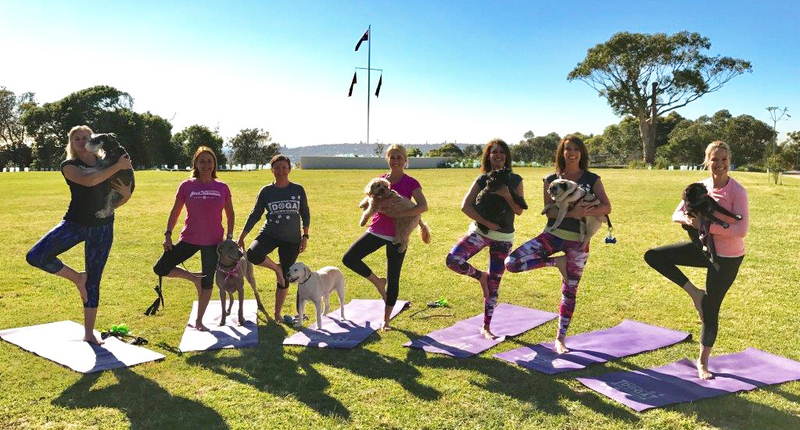 "As yoga teachers ourselves, we have used the teachings of Suzi Teitelman and our own expertise to create an Aussie Doga and we were the first in Australia to hold Doga classes." Q: What are the benefits of Doga exercises? 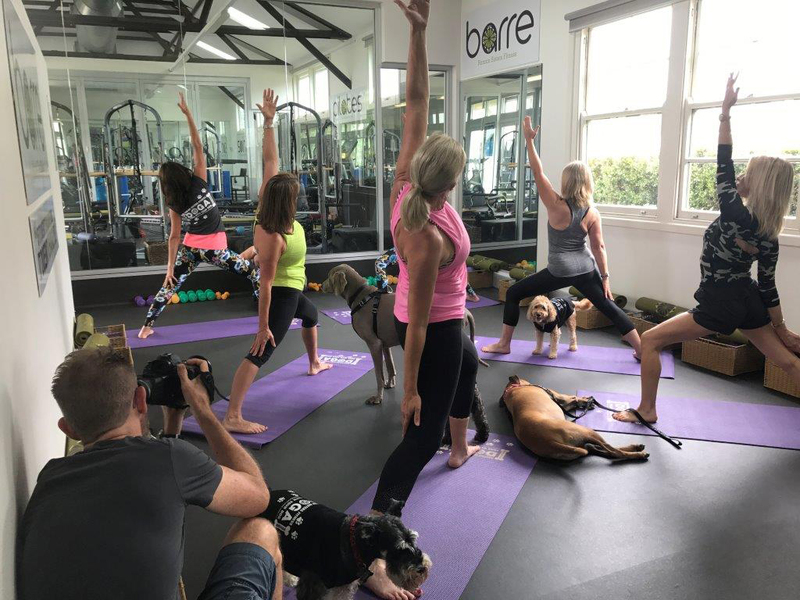 We actually found that the benefits of Doga increase with the size of the group as there's a powerful energetic healing which occurs during a Doga session. The breathing is what sets Doga apart from a regular stretch class. The parasympathetic nervous system works in conjunction with the sympathetic nervous system. This triggers the body to secrete hormones which in turn decreases your blood pressure and heart rate, inducing a relaxation response. Breathing deeply and mindfully helps stimulate the parasympathetic nervous system to trigger this response. The benefits are amplified with a larger group of dogs and owners. Q: Can anyone practice Doga or are there any restrictions? "You don't need any previous yoga experience and Doga is suitable for any breed and any size dog" explains Lisa. "Unlike running or jogging, Doga is not physically strenuous for the dog. As long as your dog is fit enough to walk and move about - even with some medical conditions - then he/she is able to participate in a Doga class. The session begins with direct massage and stretching techniques for your dog, progressing to yoga postures that will involve your dog. Smaller dogs can be held for some yoga poses, and larger dogs will remain in contact with you by touch. You just need to remember that a calm relaxed owner equals a calm relaxed dog. We have also added Pet Therapy music to our Doga sessions. This immediately helps settle not only the dog - even the most anxious ones - but their humans as well! As humans, we hear up to 20,000 Hz, while dogs hear up to 45,000 Hz and cats up to 64,000 Hz. 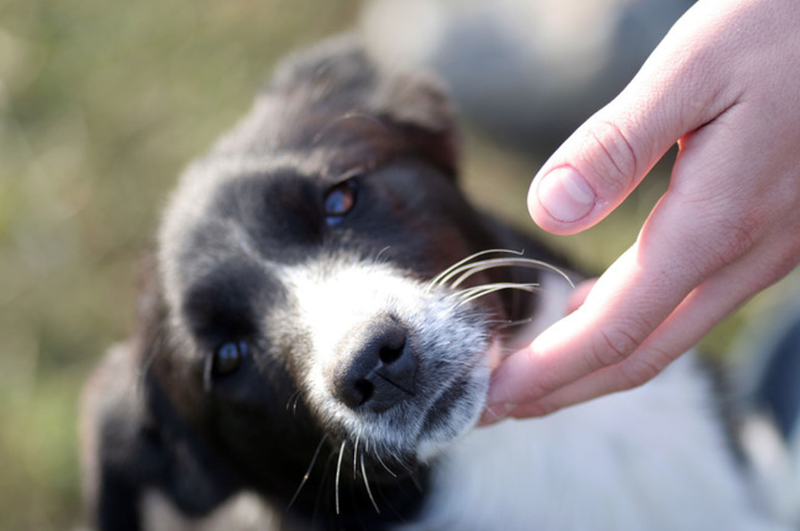 Dogs and cats have been shown to calm down when they hear low, slow, and soothing sounds. Q: Doga is practised as a healing technique for dogs with illnesses in Japan. Pet owners have the tendency to ‘rev’ their dogs up and get them excited about everything when often they need the exact opposite. The level of the hormone cortisol rises with stress and this can lead to inflammation in the body, aches and pains... Whatever you can do to calm the body will be beneficial in terms of general health and wellbeing. Traditional Eastern healing techniques are now being used on pets, especially dogs. Methods such as Reiki, energetic healing, Shiatsu will benefit stressed, anxious and sick pets. The Japanese recognise the benefits of mind and body health for both dogs and humans. At our fitness studio, our meditation practitioner works with dogs and humans for one on one energetic healing sessions with wonderful results. Q: Has Doga helped any of your client's dogs with any specific issue? Nikki Gonzalez and her Spoodle, Jazz, are so enthusiastic about the benefits of Doga they have now become ambassadors for our program! Prior to attending sessions regularly, Jazz the Spoodle suffered from separation anxiety and she was not very social with other dogs at times. You could see the change happening in Jazz as she responded to the calming, healing benefits of Doga. Doga has allowed her to start feeling more comfortable in a group environment and she has now learnt to associate a group of dogs and owners as a positive experience. She's now turned into a happier and more confident dog, without needing to have her owner by her side constantly. We laugh every time Jazz is in the class because if she were human, she would be striving to be the best in the class! We are constantly saying "look at Jazz if you’re not sure of the pose! She loves the attention and thoroughly enjoys the practice: she knows that putting on her Doga T-Shirt means there’s a class coming up." Keep in an eye out for them in an episode of Channel Ten's The Living Room with Jamie Drurie. Q: So what's next in store for dog lovers at your studio? Our Headland Park fitness studio is located in the most beautiful setting, with views out over Sydney Harbour. Of course we have the regular sports fitness equipment you'd expect to find in a gym but we also offer outdoor walking/running programs, outdoor Yoga, Kayaking sessions, Stand-Up Paddle Boarding etc. A traditional Doga session usually last 45 minutes. Doga classes are becoming increasingly popular and are priced from $20 per session at our studio. As our schedule allows, we will be adding more regular Doga classes and also teacher training courses for Doga instructors. 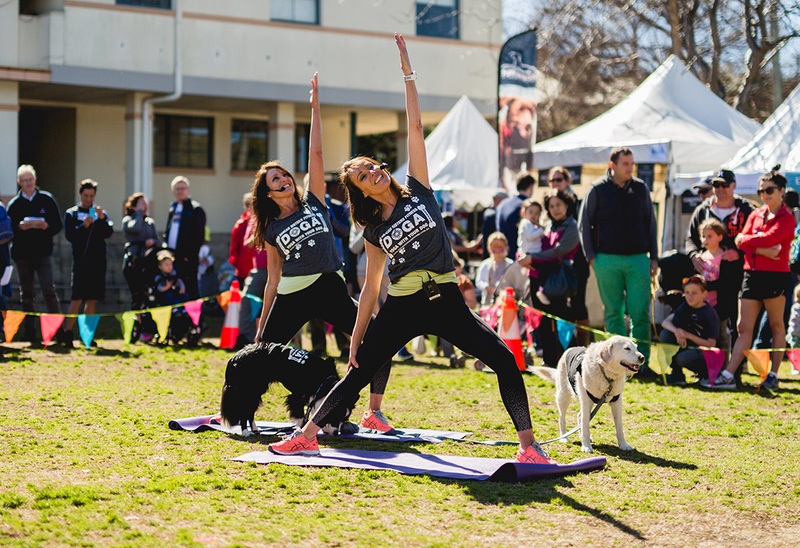 We can also come to you to hold Doga demonstrations for a special event in the Sydney region.